Author(s): Waseem Hassan, Claudia S. Oliveira, Hamsa Noreen, Jean P. Kamdem, Cristina W. Nogueira, Joao B.T. Rocha. Departamento de Bioquimica e Biologia Molecular, Bioquimica Toxicologica e Programa de Pos-Graduacao em Educacao em Ciencias: Quimica da Vida e Saude, Universidade Federal de Santa Maria, Santa Maria, RS, Brazil 97105-900. Selenium plays its physiological chemistry in mammalian living cells as the selenol group of a selenocysteinyl residue found in few numbers of selenoproteins. These proteins have antioxidant properties and catalyze redox reactions, for instance, the selenol-mediated decomposition of peroxides (glutathione peroxidase catalyzed reactions) or the selenol-thiol-mediated reduction of disulfide bonds (the thioredoxin reductase catalyzed reactions). Organochalcogens can mimic the glutathione peroxidase activity (GPx-like activity) by diverse mechanisms. Ebselen and diphenyl diselenide are two types of organoselenium compounds that have been extensively studied in the literature because they posses interesting biochemical and pharmacological properties. They can interact with reactive species (peroxynitrite, peroxides) and have anti-inflammatory properties. Ebselen was used with borderline efficacy in human trials associated with brain ischemia/reperfusion. Experimental models confirmed the neuroprotective effects of ebselen and diselenides in a variety of in vitro and in vivo models of neurotoxicity, including those associated with brain ischemia and acidosis. Ebselen is registered as a safe drug, but it has not yet been approved for the treatment of brain pathologies. In fact, the major problem with organoselenium compounds is that they have no specific target, but modulate general physiological/pathological processes (e.g., inflammatory response/oxidative stress). Thus, the future of organoselenium compounds as potential therapeutic agent will require the synthesis of target-directed molecules. 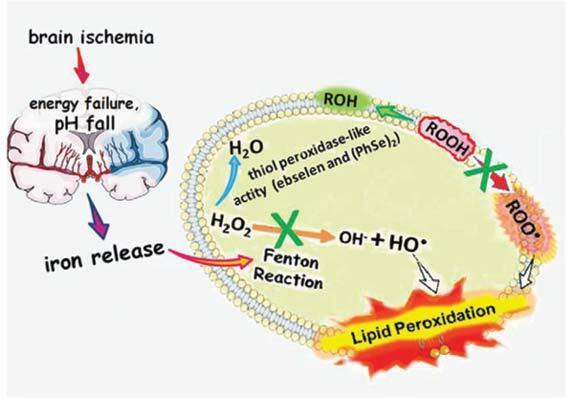 Keywords: Organochalcogens, neuroprotection and lipid peroxidation inhibition. Affiliation:Departamento de Bioquimica e Biologia Molecular, Bioquimica Toxicologica e Programa de Pos-Graduacao em Educacao em Ciencias: Quimica da Vida e Saude, Universidade Federal de Santa Maria, Santa Maria, RS, Brazil 97105-900. Keywords:Organochalcogens, neuroprotection and lipid peroxidation inhibition. Abstract:Selenium plays its physiological chemistry in mammalian living cells as the selenol group of a selenocysteinyl residue found in few numbers of selenoproteins. These proteins have antioxidant properties and catalyze redox reactions, for instance, the selenol-mediated decomposition of peroxides (glutathione peroxidase catalyzed reactions) or the selenol-thiol-mediated reduction of disulfide bonds (the thioredoxin reductase catalyzed reactions). Organochalcogens can mimic the glutathione peroxidase activity (GPx-like activity) by diverse mechanisms. Ebselen and diphenyl diselenide are two types of organoselenium compounds that have been extensively studied in the literature because they posses interesting biochemical and pharmacological properties. They can interact with reactive species (peroxynitrite, peroxides) and have anti-inflammatory properties. Ebselen was used with borderline efficacy in human trials associated with brain ischemia/reperfusion. Experimental models confirmed the neuroprotective effects of ebselen and diselenides in a variety of in vitro and in vivo models of neurotoxicity, including those associated with brain ischemia and acidosis. Ebselen is registered as a safe drug, but it has not yet been approved for the treatment of brain pathologies. In fact, the major problem with organoselenium compounds is that they have no specific target, but modulate general physiological/pathological processes (e.g., inflammatory response/oxidative stress). Thus, the future of organoselenium compounds as potential therapeutic agent will require the synthesis of target-directed molecules.